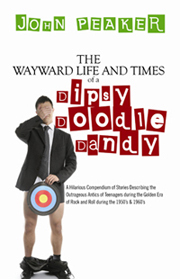 The Wayward Life and Times of Dipsy Doodle Dandy by John Peaker……. I read this book some time ago and I have been avoiding writing this review. No, that doesn’t sound so good, does it? From reading his stories, you can tell that John Peaker had a fun time growing up in the “golden age” of riding bikes without helmets and drinking water straight from the hose. He seems quite impressed with his own antics. But really, to me, the stories were riddled with a bunch of bravado. Reading this book was not unlike sitting next to drunk guy in a bar who was stumbling down memory lane – telling stories that are likely embellished and probably much more interesting in the retelling than the actual happening. If you know someone who is older and loves to tell bawdy stories, this book might be a good gift. I think the hilarity would be lost on younger generations (some of the stories would simply be bad examples for teenage boys) – which is probably John’s point – we have gotten too far away from the ability to enjoy life without being plugged in to one gadget or another. Kids don’t always pick physical play outside in the fresh air over thumb wrestling with a game controller in dark and dusty basements. The book is an easy read – it’s just a series of short essays – even the print is larger than normal. What I did take away from this book is that we should all turn off the tv or the xbox and take the time to share our stories with each other and maybe even go so far as to write them down. ← The Four Agreements by Don Miguel Ruiz……. I love it… “…like sitting next to a drunk guy at a bar…” Hey you should be honest in all things and straightforward with your opinion. Good for you, Ellen. Once again you inspire me…when I’m done with my current writing project I will review something I’m reading as well. My sis gave me a Book Journal for Christmas and I am having fun recording my reaction to various books. Your reviews were a fun read!